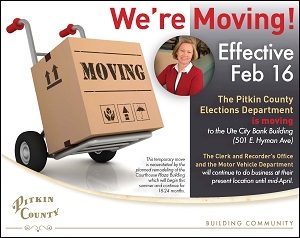 The Pitkin County Elections Department, now located on the ground floor of the Courthouse Plaza is moving to its new location in the Ute City Bank building arcade, at 501 E. Hyman Ave, on February 16th. Elections is the first county department to clear out of the Courthouse Plaza, in advance of the anticipated gutting and remodel of the building beginning this summer. Elections is moving early so it can get established and functional in its temporary location as the presidential election season begins. “With local caucus activity beginning March 1st it’s important for Elections to hit the ground running in it’s new, temporary space,” said Clerk and Recorder, Janice Vos Caudill. “We want the public to become very accustomed to us being in the Ute Building arcade should they need in-person assistance navigating voter registration, and understanding the mail ballot voting process,” Vos Caudill said. The Clerk and Recorder and Motor Vehicle offices will be the next to move out of the Courthouse Plaza. They’re relocating to the Vectra Bank Building, at 534 E Hyman Avenue Aspen, in mid-April. The remaining Courthouse Plaza Departments won’t move until mid– summer to their new, temporary location in downtown Basalt. The exact date of the move has yet to be determined, but ‘mid-July’ is the goal. Beginning this summer (at a date to be announced) the Courthouse Plaza will be gutted and remodeled and construction of the new Public Safety/Administration building will begin. Construction is expected to continue for 18 to 24 months. All Courthouse Plaza departments and employees, with the exception of the Clerk and Recorder, Motor Vehicle, and Elections, will be relocated to Basalt. Departments making the downvalley move include Business and Information Technology (the county’s IT, GIS, and Business Processes offices), Human Resources, Finance, Open Space and Trails, the County Attorney, and the County Manager’s and Board of County Commissioner’s Administrative team. Downtown Aspen County departments not currently housed in the Courthouse Plaza will remain in their current locations. These departments include: Community Development, located at Aspen City Hall, and the Assessor, Treasurer, and Sheriff located in the Pitkin County Courthouse. “While we understand that there may be some inconvenience associated with our offices moving we have worked hard to ensure that our most ‘public facing’ offices remain in Aspen,” said County Manager, Jon Peacock. “The Board of County Commissioner meetings will remain in Aspen and be held in the new Library meeting room during construction,” Peacock said.